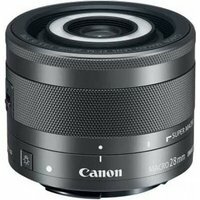 The Canon EF-M 28mm f3.5 Macro IS STM lens is the first macro to join the EF-M range and a world's first to feature built-in LED lights. Designed for EOS M users looking to explore the world of macro photography, this compact, lightweight lens offers a 45mm field of view (35mm equivalent) and has a true magnification ratio of 1:1, meaning the object you are shooting appears life size in your image. The pair of built-in miniature Macro Lite electronic flash units on the front of the lens illuminate close-up subjects, making it great for food and flower photography, as well as small objects with intricate details like jewellery.